Imaginethat you could send a single short message through time to anyone who has everlived, telling them one modern fact that would give them hope for the future ofhumanity. I don't think you could find anything more powerful than this: Humanbeings have walked on the Moon, and upon first arrival left a plaque that read"We came in peace for all mankind." Noother single event in human history would be both so understandable -- afterall, everyone can see the Moon -- and so amazing at the same time. For most ofhistory, a trip to the Moon would have been considered impossible. Even once itbecame possible in principle, few believed that it could really be done. Butnot only did we do it, we did it in a way that made it belong to all ofhumanity, not just to the astronauts who made the trip, to the people who builtthe program, or to the nation that paid for it. Surely, if we are capable ofthat, it would seem that we are capable of anything. Orrather that we were capable. 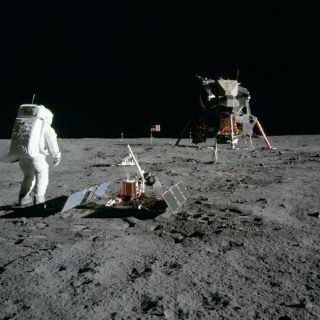 For this year marks the 40th anniversary of thelanding of Apollo 11 on July 20, 1969. Those of us old enough to remember thatday will recall how it riveted attention around the world, even from ourenemies at the time. As NeilArmstrong took "one small step for a man, one giant leap for mankind," weall shared a brief moment when humanity seemed poised on the brink of atranscendent future. Thesuccess of Apollo 11 was followed by several more trips to the Moon, along withthe astonishing rescue of Apollo 13, but it was all over by the end of 1972.We've had many remarkable achievements since that time, including the greatsuccesses of our robotic probes to the planets and the Hubble Space Telescope,but no human being has again gone beyond low-Earth orbit -- a distance barely1/1000 of the distance to the Moon. The startling truth is that, to scale, thedifference between our current human space voyages and the voyages of Apollo isas great as the difference between a walk the length of Central Park and a walkacross the United States. Theproblems we face today are very different from those we faced 40 years ago. Thewell-defined enemies of the Cold War have been replaced by the cat-and-mousebattle against terrorism, worries about urban air pollution have given way toworries about the global climate system, and we are in the midst of a global recession.The key to the solutions, however, remains the same, just as it has remainedthe same throughout history: We need to believe in ourselves, and to inspireand educate our children, so that we can rise above our current problems andbuild a better future. Thatis why I believe it is time for us to recommit ourselves to our future inspace, beginning with a return to the Moon. But we must do it in a way thatensures it is the start of greater things, not an end in itself that can fadeinto memory like Apollo. Unfortunately, NASA's current plansfor returning to the Moon are under funded, lacking in vision, and tooparochial. We can do better. First,we must returnto the Moon with a clear vision, and I believe it should be this: To buildan international research outpost at which people of every nation, every race,and every religion will work together in pursuit of fundamental knowledge anddiscoveries that advance the common good, so that every child on Earth can lookup at the Moon in the sky and say, "We are working together up there, so surelywe can work together down here." Perhaps a Moon outpost cannot by itself put anend to terrorism, but by providing a constant reminder of the great potentialof the human race, it surely can help. Second,we must commit the resources needed to achieve this vision. Adjusted forinflation, NASA's funding today is far smaller than it was during the Apolloera. Investments in space have always returned far more to our economy thanthey have cost, so greater NASA spending can help lift us out of our currenteconomic doldrums. Since the venture should be international, it can help othernations as well. The new program should also provide opportunities forbusinesses and entrepreneurs, because only through private enterprise can wesecure a long-term future in space. Third,we must not wait any longer. In the 1960s, we landedon the Moon barely 8 years after President Kennedy started the Apolloprogram. With the advances that have since occurred in business and technology,we should be able to do at least as well now. Inthe Bible, Moses and the Israelites were forced to wander the desert for 40years before they enter the promised land. The new promised land is theunlimited frontier of space, and we've already had our 40 years in thepost-Apollo desert. It is time for us to reclaim the promise of Apollo, andbegin down the path that will take our descendents to the stars. Jeffery Bennett is anastronomer, teacher and writer. He brings space exploration to life in a seriesof children's books that star Max, aspace-faring dog. With SETI Institute's Senior Scienist, Seth Shostak,Bennett co-authored "Life in the Universe," a widely used college-levelastrobiology textbook. Bennett also authored college texts in astronomy,general mathematics and statistics. And, he considers the search for life inthe universe in "Beyond UFOs: TheSearch for Extraterrestrial Life and Its Astonishing Implications for OurFuture."